So yes – I, like many others last week, have jumped on the Agent Carter bandwagon. Captain America: The First Avenger, I’m not ashamed to admit, is my favorite film of the current Marvel Cinematic Universe (though Avengers and the first Iron Man are very close seconds). But, much as I love Steve Rogers (and I do, I really do), his leading lady Peggy Carter is a big part of why I loved that film.Though I don’t like that Peggy is the only substantive female role in the film, I can overlook that due to the depth of the role she is given. Agent Peggy Carter is a direct, no nonsense, unflinching woman in a man’s job, who constantly proves she is just as, if not more, capable. Rising from her mere love interest status in the comics, Peggy’s character stood out so much to fans and to creators that she has not only appeared in a number of Marvel companion works, but is now the center of her own mini-spinoff. Which is so awesome! She is so far the only female character in the Marvel Cinematic Universe to have her perspective as the central narrative**. Steve Rogers might be Peggy’s inspiration and the story’s jumping-off point, but Agent Carter truly is Peggy’s story. Y’know who’s another awesome female character who went from a supporting role to starring in her own series? …That is until 2006, when the character was brought back for an episode of the rebooted Doctor Who (as the showrunner had been a fan of her character as a child). Viewers appreciated her reappearance so much that she was soon given a spinoff series, The Sarah Jane Adventures, which was aimed towards a slightly younger audience. In her spinoff, Sarah Jane becomes the leader of a group of children, using brains instead of brawn to deal with alien threats. Is it childish? A little. There are less developed stories, some gross-out jokes, hammy aliens. But Sarah Jane kept it grounded, always making the stories believable, and causing a new generation of children to fall in love with her. Just what is special about these two ladies that caused them to break out from supporting roles to lead their own stories? Perhaps in seeing what they have in common, we can pinpoint that touch of star quality. Though their stories are rather different, we can see a number of parallels in their personalities, initial roles, and later development. Here is part one of our exploration into these two characters. And that is not a bad thing! Also, this is not to say that the Doctor or Steve Rogers aren’t already good people. But the Doctor, as is often noted, needs companions to stop him from losing touch with his humanity (as much as an alien time lord can be human). And Steve, always feeling responsible for protecting people, cannot always bear the weight of the world alone. Both the Doctor and Steve hold a deep respect for their companions, and they show it. They also made connections to people other than the lead character, as Peggy did with Howard Stark and the Howling Commandos (who establish S.H.I.E.L.D. together after the war) and Sarah Jane did with fellow companion Harry Sullivan and with the Doctor’s longtime friend Brigadier Lethbridge-Stewart (who helps her out in The Sarah Jane Adventures), so neither woman was solely dependent on one person (though, again, for them to have no other significant females to interact with is problematic). As leads in their own shows, Peggy and Sarah Jane now take charge to fight antagonists. Though Peggy is working for the SSR (relegated to the demeaning role of secretary) and Sarah Jane works as a reporter, their true calling lies outside the system, as Peggy works to clear a friend’s name and Sarah Jane monitors alien threats from Bannerman Road, intending to thwart them without calling in the big guns. Interestingly, we see them essentially take the mantle of the person they admire, but with their own personal flair still at center. In Agent Carter Peggy dons red, white, and blue and beats down bad guys. 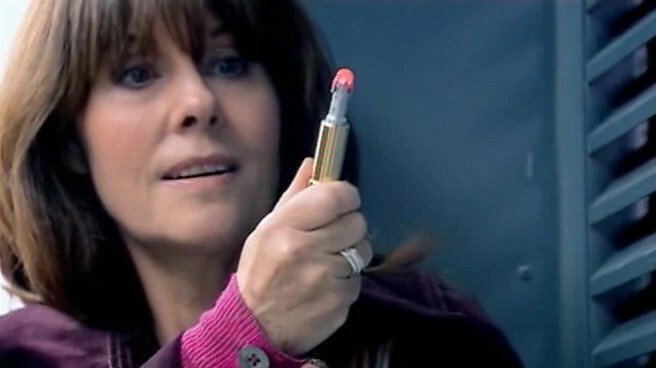 When juxtaposed with a Captain America radio show, in the clip above, Peggy is basically in the Captain America role rather than the girlfriend role of “Betty Carver.” In The Sarah Jane Adventures, Sarah Jane acts as the mentor to a younger generation of curious investigators as the Doctor was to her, sporting a sonic lipstick (pictured above), which functions similarly to the Doctor’s sonic screwdriver, and using her knowledge of alien races and peaceful problem-solving philosophy gained from traveling with him. They are also initially very much alone in their endeavors, and intend to keep it that way. After losing both Steve and her innocent roommate due to being involved in dangerous business, Peggy intends to continue on her secret missions alone, and passes up a housing opportunity near another girl she considers a friend. Sarah Jane, who came from no family and had a hard time connecting to others after her travels with the Doctor (for fear of being called crazy), she comes off as very cold to people she meets. When her young neighbor gets involved in an alien investigation, she feel very uncomfortable bringing anyone, especially young children, into her dangerous life, and tells Maria to forget the whole thing. But Sarah Jane comes to create a new family in the course of the series, as she adopts the genetically-engineered boy rescued from aliens in the first episode, named Luke, and bonds with Maria and her schoolmates Clyde and Rani, sharing in alien adventures with them. She also faces traumas in her past, such as her parents’ abandonment and subsequent death and her childhood friend’s premature death (kids show it may be, but it’s still related to Doctor Who. There are feels galore). And those who watched Captain America: Winter Soldier know that Peggy eventually married and started a family, so it’s possible viewers will see the beginnings of that in the course of the series. There are tentative connections established between her and Howard Stark’s butler, Jarvis, and a fellow co-worker injured in the war, and the previously mentioned automat waitress, in the first two episodes, so we shall see if Peggy can establish some camaraderie with them. We might also get to see Peggy’s past from before the war. The point is that while Peggy and Sarah Jane are incredible all by themselves, they need to be connected. Both their character development arcs seem to be focused on learning to let others in. As supporting characters, their development was background to the development of the main characters. In Sarah Jane’s case, she didn’t get much development at all when she was a full-time companion, but her development in her New Who appearance, learning to let go of the Doctor, was somewhat background to the central conflict of Rose Tyler realizing she might be forgotten by the Doctor someday. But with their spinoffs, their development can take center stage, and that, I think, is a very powerful thing. Viewers wanted more of them, but they don’t just get to see them in action – they get to see them mature and become deeper characters. That’s all I’ll be talking about for this week. Tune in next week for the second part of this article, and let me know in the comments what you love about Peggy Carter and Sarah Jane Smith. * Captain America: The First Avenger. ** Agents of S.H.I.E.L.D. has quite a lot of great female characters who are often the focus of individual episodes and arcs, but it is still more of an ensemble show than a female-centered show.